LOL Via @thebestfails⁣ ⁣ Submit your fails on my site to be featured! Link in bio! You knew something like that was going to happen as soon as you heard the revs go up past 10,000 rpm. Today’s video, though, is of a completely different nature. These aren’t lone kids left to their own devices. These look like grown adults celebrating some occasion in the church rumpus room, when somebody decides it’s time to perform a smoky burnout on a very healthy-sounding Aprilia, on what appears to be a folding table. Or a bench. I guess we don’t want to mark up the concrete floor? Do his friends talk him down from this idea? No, they join in as willing picadors, corraling the angry Aprilia while the mighty matadore brings up the rpm. Actually, these are Germans. Is there a Germanic equivalent to bullfighting? What the hell are we attempting here exactly? 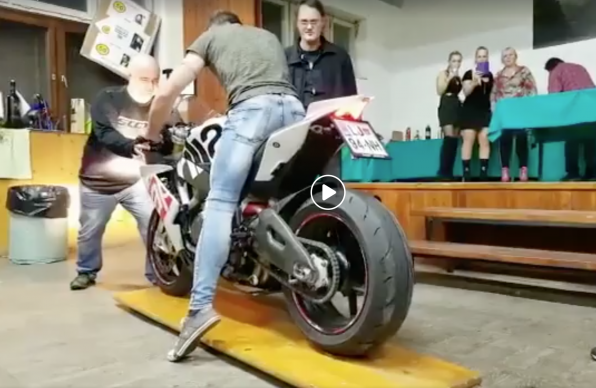 Right, I don’t believe hurling the table across the room was the intent, but it does serve to show us the power of the RSV4 and the available traction of rubber on wood. Really glad nobody was badly splintered or decapitated. Let’s learn from this, everyone. #1, motorcycles and alcohol really don’t mix. #2, never stand behind a running motorcycle (or in front of it, or anywhere near it) when there’s a nut behind the wheel. Merry Christmas, Happy holidays. Let’s keep it safe out there.